Of the two formulations shown below, which one is the right formulation for the First Law of Thermodynamics, the one on the left or the one on the right? None of them is the First Law of Thermodynamics, although both of them are compatible with this law of physics. The formulation on the left is the CICO theory (Calories In Calories Out). This formulation implicitly assumes that the adipose tissue is a passive tissue that stores that part of what we eat that is left after the body uses what it needs. My point here is that this formulation defines a physiologic behavior for the body and that physiologic behavior is compatible with the First Law of Thermodynamics, but it is not necessarily correct. The formulation on the right is also compatible with the First Law of Thermodynamics. In the physiologic behavior proposed by this second formulation, the adipose tissue has an active role in the fattening process, while it is assumed that the rest of tissues and organs of the body can manage what the adipose tissue does not store. According to the formulation on the left, any weight problem can be solved by adjusting the energy intake and the energy expenditure. This detail is important. According to the formulation on the right, the energy intake and the energy expenditure have no influence on the growth of the adipose tissue. 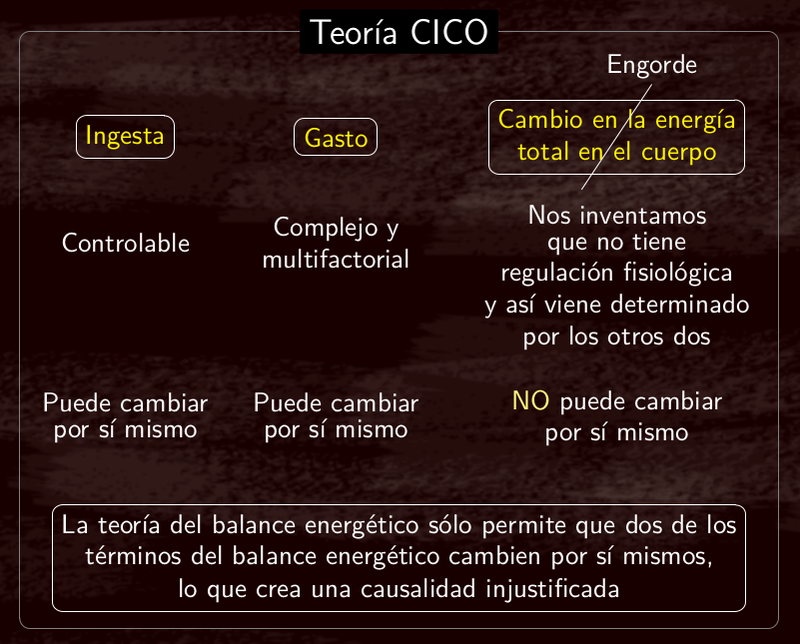 According to this formulation, talking about the terms of the energy balance does not allow us to control our body weight. Again, I want to emphasize that this is an important detail. In conclusion, talking about calories only makes sense if the formulation on the left is correct, if, by chance, the human body behaves as this formulation assumes. If the formulation on the right is the correct one, trying to manage our body weight by changing the energy intake and the energy expenditure is completely meaningless. ”Caloric excess”, ”eating above our needs”, ”caloric deficit”, etc. are expressions that only make sense within the formulation on the left, and, therefore, their use is always fallacious, since their mere use is equivalent to assuming the validity of the CICO theory. The greatest stupidity in the history of humanity is to have assumed as obvious that the formulation on the left, the CICO theory, is the First Law of Thermodynamics itself, and that, therefore, it is not a hypothesis but an indisputable fact of physics, because ”energy has to be conserved”. We are told that CICO ”is physics” and that ”it is correct” because ”in terms of energy 2+2=4”. The direct consequence of this insane mistake is to assume that it is possible to control our body weight by controlling the calories we eat or the physical exercise we do. This conclusion will always be reached in the CICO theory, since it is implicit in its unwarranted formulation. Anyone with a basic academic/scientific background understands that it is wrong to apply an equation when the conditions for its use are not met. – the adipose tissue does not have physiological regulation, or, in other words, does not have the capacity to change by itself. Why can’t we accept to apply the CICO theory in other tissue growths? Because we know that the two conditions above are not fulfilled: e.g. a tumor can grow by itself, regardless of what the rest of the body does, and other forms of stored energy can concurrently change. 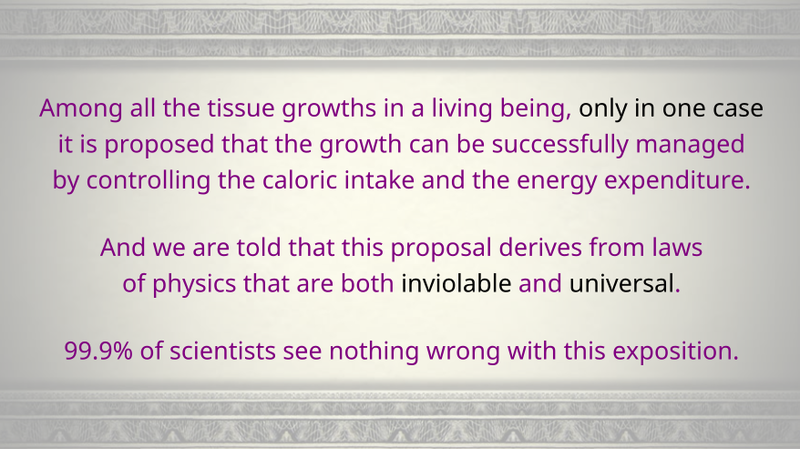 The growth of a tissue has nothing to do with the energy balance of the whole body. No fallacy can convince us that the CICO theory is applicable, unless we are imbeciles.